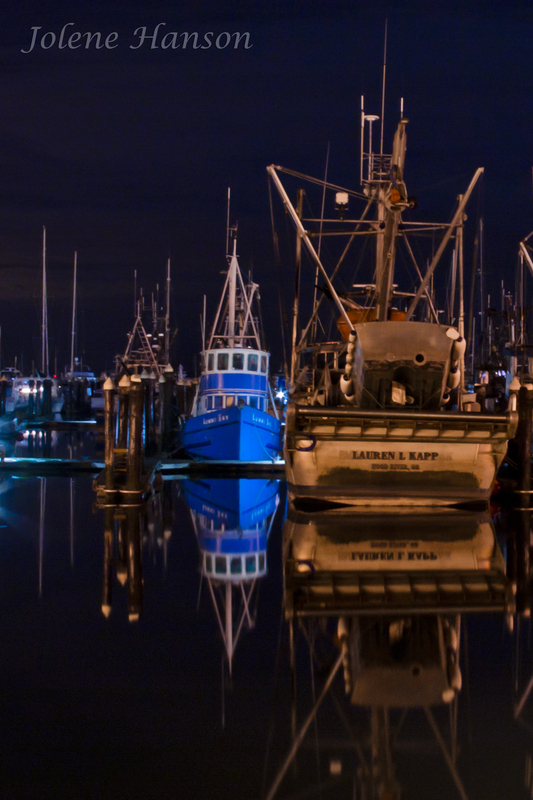 Tonight I pulled out the new tripod and headed to the marina for my first attempt at after dark photography. Long exposures, low light…what fun, right? Yeah….I have a LOT to learn. I played around until a herd of skateboarders came barreling through and disrupted my quiet concentration. This shot was probably the best attempt, but had to cropped because of some lens flare I just couldn’t live with. I know, David will hate be annoyed by this because the entire reflection of the large boat isn’t captured! Anyway, considering the slow shutter speed, how do I combat the flare from the lampposts and other light sources that will then become over exposed? Suggestions from those with experience with low light photography? You have captured this low light image very nicely. I love it. It’s something I’m not very good at, haven’t experienced enough with so I won’t comment on the techniques. I do think that you did a really nice job here. The boat’s reflections are awesome – there doesn’t appear to be one ripple in the water. It looks like a sheet of ice. It’s a good shot. You might try higher ISO combined with a shorter exposure – depends on the capability of the camera. Other thing with light sources – work the angles – if you’re getting too much flare play around up / down / left / right and see if you get something you like better. Your camera takes awesome night shots, Mike! Do you ever use any filters or lens hoods, or do you just play with the ISO and exposure times? I almost always have a lens hood on. I don’t use filters for night / low light shooting. The main things I experiment with are combinations of ISO, exposure time, and aperture. For example when shooting a moonless night sky I usually go for wide open aperture, a high ISO setting, and a short exposure to minimize star trails. (Unless my goal is to get star trails). The D7000 is great for low light – you can go up to ISO 25600 in extended mode and it has specialized in-camera noise reduction for both high ISO and long exposures. Embrace the light sources and work with them. A strong light source with a small lens aperture can create a beautiful star pattern in the shot that can be very pleasing. Of course, if the light is too close and too bright, then you may want to find another angle for the shot where you can avoid the light source entirely. You’ve done well while picking a challenging subject – boats on water are, of course, bobbing with the waves and are tricky to capture sharply in a long exposure. Nice shot! Thank you for the suggestions, Mike! Some of the star patterns from the light last night were nice – the others produced too many orbs. I think it will be trial and error, and possibly some new camera accessories, to get the night time stuff right. Very nice! Again those interesting colours. Thanks, Lisa! I will need more practice for sure, though. And, one thing I didn’t note in my post was that my hands were freezing. I think it’s time to invest in some good gloves just for night photography! A lens hood will help out with the flare…but you know, flare can be a cool addition! Did you use a low ISO? You can use the LiveView option to see if there’s any flare and then use your hands cupped around the lens (of course, making sure they are not in the picture…thumb!). Now now, the missing part of the reflections doesn’t bug me…that much! 😛 Nice job Jolene. I like this photograph, it’s very nicely done. Slight angle to it though which may be worth correcting next time. Thanks, Nigel – I kept looking at the angle and couldn’t decide if it was just me or if there was really an angle. That’s the problem with editing too late at night. What I like about your low light shot is that you still managed to capture an abundance of color. Great job.